"This is a delicious and easy salad that my mother-in-law makes." Classic French salad made for summer eating! Neither my husband or I really liked this dressing too much. Other than that, it is a pretty mainstream salad, so it just wasn't that great. Love the Dressing! EXCEPT I agree with comments below that it is too salty!!! Must use Garlic POWDER....Then it will be awesome! Loved the ingredients but prefer my own olive oil viaigrette. Not as good as I had hoped. Next time I would add more tomatoes and cut back on the olives. This salad has become a favorite of ours. It goes great with any meal-especially Italian. This was wonderful and very simple. 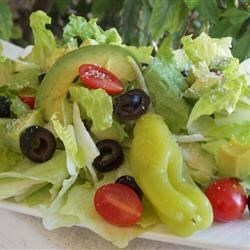 This is a wonderful salad and I've used just the dressing for other salad varieties as well. I've passed on the recipe many times!